Testosterone is the anabolic male hormone responsible for the proper functioning of a whole array of “masculine” characteristics in humans, chief among them being the ability to build lean muscle mass. Naturally occurring hormonal levels are plenty for most bodybuilders to achieve impressive physiques naturally, however this is dependent on healthy individual natural test levels. TL;DR: You can buy a kit off Amazon that uses your saliva to check your hormone levels pain free. This is the best kit we could find available on Amazon. Total levels for males increase steadily up to about the age of 17 or 18 at which point they generally level out before beginning a slow decline (about 1% per year) after the age of 30. 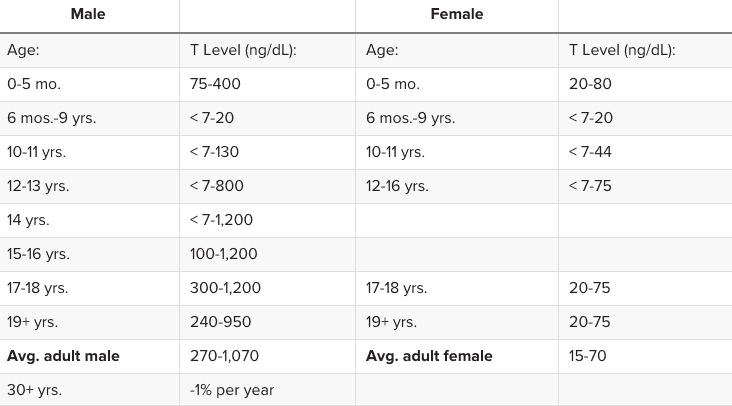 For a more scientific breakdown of what is considered “healthy” at any given age group refer to this testosterone-levels study. Symptoms of having depressed test-levels as a man include reduced sexual drive/low libido, fewer random erections, unreliable erections (erectile dysfunction) and infertility. More general symptoms include lack of energy, lack of enthusiasm, apathy, poor or irregular sleep, mood swings, weight gain/increased body fat, particularly around the hips and pectoral areas. The problem with determining if you have low testosterone or not is the fact that the natural range can vary so greatly. Medical professionals define the natural testost range to be between 270 nanograms per deciliter and 1,100 nanograms per deciliter. That is an absolutely massive variance, regardless of age. Imagine two individuals have been working out for 5+ years. One guy has 1,000 ng/dl and the other has 300 ng/dl, literally less than 1/3rd the test levels of the other individual. Then multiply that difference by 5 workouts a week, four weeks a month, 12 months a year, for five years. The cumulative advantage of the “naturally high test” individual is profound. This is likely one of the primary reasons we can see so much discrepancy between natural bodybuilders, as the difference between competitive athletes and instagram celebrities and “average Joes” can be enormous. This myth has been thoroughly “busted”. Of course, some times amazing discrepancies in physiques can be attributed to deception, since we know that not all naturals are really natural. Still, in bodybuilding organizations that do regularly test for banned substances and performance enhancing drugs the difference in muscle mass between competitors can be eye opening. Assigning such a wide range of natural T levels is at the crux of what makes prescribing changes so difficult. How do you determine you are abnormal if the variance range for a “normal” individual is so large? Well, before you can plan a course of action to increase your test levels, either naturally or enhanced, you first need to know where you stand. If you have a solid healthcare plan via your employer or parents then getting a test done at your local clinic is a quick and straightforward way to understand where your starting point is. If you lack health insurance or if you would just prefer to be more discreet about your testing there are some self-administered kits you can order online to get accurate T evaluations from clinical labs via mail. If you want to test your hormone levels at home or you are just afraid of needles then your best bet is an at-home saliva test kit. These kits can be purchased on sites like Amazon and mailed discreetly to your house. Most kits come with lab-testing services included, so after you provide your saliva sample you mail the kit to the associated companies laboratory and they run a series of tests for you. Home testing use saliva-based testing methodology, which is quick, painless and easily to repeat multiple times over months to track changes from baseline levels. The only alternative is getting blood drawn on a monthly basis at your local clinic, which can be cost and time prohibitive for many working individuals. When it comes to “test kit A vs. test kit B” it is more a matter of comparing features than it is quality since most companies use the same equipment and test methodology. When choosing your kit the best process would include first identifying the hormones you want to be tested for. For example are you simply looking for a baseline testosterone level report or would you also like to know your cortisol and estrogen levels to get a bigger picture of how your endocrine system if fairing. Below are the best selling and most highly reviewed hormone testing services you can easily obtain online. Compare the features and prices for yourself to make an informed purchasing decision. Overall Everlywell and ZRT Labs are the two most popular DIY testing kits within the bodybuilding community. They not only have a solid reputation but are easy to use, price competitive, deliver results quickly and have been shown to be very accurate amongst user logs and individual reporting in bodybuilding circles. Don’t be turned off by high prices, this isn’t just for the kit itself but also pays for trained medical professionals in a laboratory to analyze your saliva and create a report on your hormone levels. If you compare these prices to what it would cost to have similar tests done in a local hospital or clinic these do it yourself home kits are by far the more affordable option. Going to a clinic to get blood drawn intravenously used to be the only way to test human hormone levels. The problems with this method are numerous, from requiring a clinic visit to difficulty locating veins and so on. In recent years advances in salvia testing technology has made it not only a viable alternative but a more reliable testing method. Unlike blood tests, which only test bound hormones, saliva tests can measure unbound hormones that have yet to act on their target tissues. Around 95-99% of steroid hormones that are present in the bloodstream are already bonded to carrier proteins, meaning they already have a designated destination and use for the body. Saliva on the other hand contains unbound bioavailable hormones without designated use, which makes it a more accurate measure of total free circulating levels of hormones. Thus, the myth that blood tests are more reliable or accurate is just that: a myth. Skinny Yoked recommends you save yourself some time and money and go with a saliva test. Once you’ve gone ahead and done your testing you have a few options. If your natural T levels are in a healthy range you can turn you focus to your training regimen and diet to to try to up your gains since T isn’t one of the issues holding you back. If your levels are on the lower end of the healthy range then you can look into natural test boosters to try to up that level to as high as possible, while remaining in the natural zone . Yes that’s right, test booster products CAN actually increase your testosterone. Far too many fitness personalities right them off as entirely as a scam but that is careless. There are proven over the counter ingredients like D-aspartic acid, vitamin D, Tribulus, Fenugreek, Ginger, DHEA, Zinc, and Magnesium (ZMA). Combined with a diet rich in healthy fats (omegas) and high in protein, and assuming you’re getting 8+ hours of sleep a night, it is entirely possible to up your total test levels to the higher end of the natural spectrum with over the counter products. 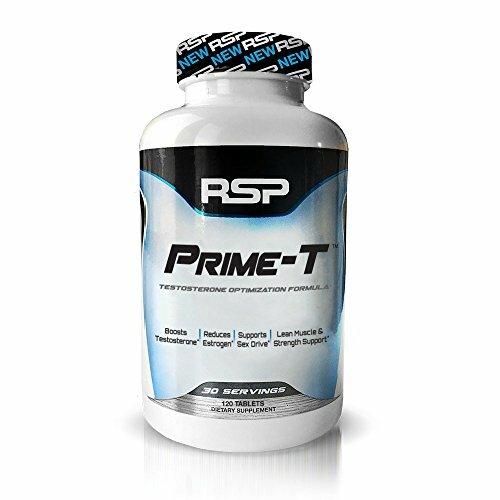 We’ve even run experiments using testosterone suppressing PEDs like Ostarine and MK-677 and found recovery a breeze with OTC test stimulating products like RSP Labs Prime T for example. Outside of boosting your natural test levels, that is encouraging your body to up it’s production, there may be other options depending on your age and what your doctor feels is reasonable for your fitness and lifestyle goals. Generally speaking if you are well under 40, that is in your 20-30’s, prescriptions will be different than if you are over 30 years of age and then even more different if you are over 50 years of age. From testosterone production optimization via diet and lifestyle to straight up testosterone injections like bodybuilding pros, the levels of testosterone therapy options range widely depending on individual age and goals. If you are in your twenties your body should be capable of maintaining sufficient T-levels on it’s own. If you are feeling low it is important to re-evaluate your lifestyle. Make sure you are working out correctly (lifting heavy regularly stimulates T production, but over-training can reduce it), eating correctly, not abusing alcohol, minimize your stress and cortisol levels, up your supplements, avoid estrogenic substances/foods. While some pre-workouts are better for sheer energy (like the extremely powerful Nitraflex from GAT), there are other’s that include testosterone-supporting ingredients as well like B-Nox from Betancourt Nutrition. If you still have low T-levels after optimizing both your diet, workout routine, supplementation and lifestyle then it’s important to see a doctor as something more serious like thyroid dysfunction. Men generally start a solid and steady decline in natural test production after the age of 30. Even implementing lifestyle improvements like those suggested for twenty-something year olds may not be enough. Adding exogenous testosterone on top of your natural levels from an external source, may be necessary. Supplementing your own T production is a serious decision to be made with a doctor as it is often a life-long commitment as coming off testosterone supplementation/augmentation will drop you back to your baseline levels. Common hormonal therapies for younger men looking to regain their youthful test levels can include testosterone-leaching skin patches, topical gels, topical gums, tablets and orals, pellets implanted subdermally, or low dose test injections. If you are over the age of fifty you will almost always require an external stimulus to increase your test-levels which will include the above therapies but more often than not usually trend towards more substantial doses of test injections. Having a solid insurance program is key here as regular moderate testosterone injections aren’t cheap when performed by a professional. Optimizing your T levels as a man is an important and life-changing choice that most active men and bodybuilders need to consider at some point in their lives. There is a lot of negative stigma around TRT (testosterone replacement therapy) for example because of abuse but that shouldn’t hold any man back in exploring his options to live a healthy and happy life. The first step in solving any problem is knowing where you stand. By running a quick saliva test and getting baseline hormone levels you can better strategize with your physician on a course of action that is customized to your personal goals, both inside and outside of the gym. Health Disclaimer: This is not medical advice and should not be used as such. Regarding your body and hormone levels it is always best to consult with your physician.